The late John Voelker (AKA Robert Traver, author of Anatomy of a Murder, Anatomy of a Fisherman & others) penned this penetrating and insightful piece. It's the perfect justification, in our opinion, for those who are passionate about their fishing! The beautiful brook trout illustration by Joe Tomelleri combined with the Royal Wulff fly, complement the prose perfectly. Double matted and foam backed, the TESTAMENT OF A FISHERMAN is ready for the 16" x 20" frame of your choice. This superb piece, a Rogue Angler exclusive, would be a hit with any fly fisher - we guarantee it! 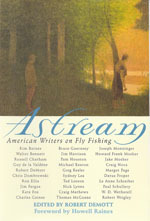 "I fish because I love to; because I love the environs where trout are found, which are invariably beautiful, and hate the environs where crowds of people are found, which are invariable ugly; because of the television commercials, cocktail parties and assorted social posturing I thus escape; because, in a world where most men seem to spend their lives doing things they hate, my fishing is at once an endless source of delight and an act of small rebellion; because trout do not lie or cheat but respond only to quietude and humility and endless patience; because I suspect that men are going along this way for the last time, and I for one don't want to waste the trip; because mercifully there are no telephones on trout waters; because only in the woods can I find solitude without loneliness; because bourbon out of an old tin cup tastes better out there; because maybe someday I will catch a mermaid; and, finally, not because I regard fishing as being so terribly important but because I suspect that so many of the other concerns of men are equally unimportant - and not nearly so much fun. 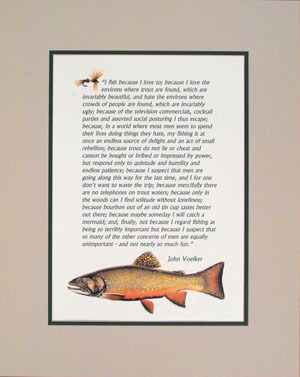 John Voelker"
Available Frame Ready matted or Print only.